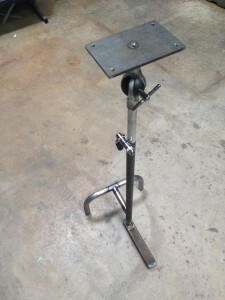 The path to building and refining an infinitely adjustable tattoo arm rest. Our first tattoo arm rest. I started down this path to make a tool for a very good friend. I am sure you have a friend or two who is super talented, always there when you need them, and not only likes working with nice tools and equipment, but seems to be able to make their tools do more than anyone else can. The previous sentence describes one of my best friends Butch Fairbanks perfectly. Butch ran Moms Tattoo in Tempe years ago and recently set up a new small private studio. In the process he reclaimed and refurbished most of his equipment that had been on loan, new upholstery, new paint, fabricating non existent parts for his chair, generally making things right, working, and functional. Moms Tattoo was taking shape again however the arm rest he had used for years got cut up to make another piece of furniture while on loan. The replacement arm rest was sloppy, had a big base that got in the way, and is poorly made. Butch rarely asks for anything, he is a networking fiend, and super talented craftsman. If Butch can’t make it he knows more than 100 people who can. When my buddy asked if I could build him a tattoo stand, my answer was absolutely yes! The baseline for the first stand a napkin sketch with, height, width, number of legs, and the basic form. In a few days I put together the prototype and probably could have left it at that if I didn’t start asking myself questions. How could I make this arm rest function better? Are tattoo artists like mechanics and want or need good quality tools if they use them every day? I decided to make several more arm rests and find out. Our second generation tattoo stands. With some input from another good friend and customer over a few beers while talking race cars and commerce, I was convinced making a few changes to the height, the shape of the legs, and the feet used would make the overall design better and easier to use. So I built a few. In my mind the changes we made to the base and upholstery in gen 2 made noticeable improvement to the overall feel and functionality. We built a handful of gen 2 stands and needed to see how they would compare with the first prototype. We visited 5 shops on the first day we had the Gen 2 stands complete,and found the feedback on the product was really positive. I received some great suggestions on improvements that could be made, and what features traveling artists were looking for. I am really thankful to the artists who took their time to give me their advice and opinions. Within a day we made a few changes and our Gen 3 prototype. All of the improvements were in the to the design of the base. We widened the rectangular foot for more comfort and stability, and added a wider and stickier foot to the third leg. We made the other two legs a bit longer for a wider footprint and more stability. And made the base unbolt for compact packing while traveling. I was really starting to like the feel and function of our tattoo stand and visited more shops doing research and asking opinions. The more tattoo artists I visited, the more positive feedback I received on the design. I thought we were really close to having a product that is as good as we could build. Our Gen 3 stand with a wider foot, a bigger base circle and travel friendly. Base has an easier design and requires no tools. 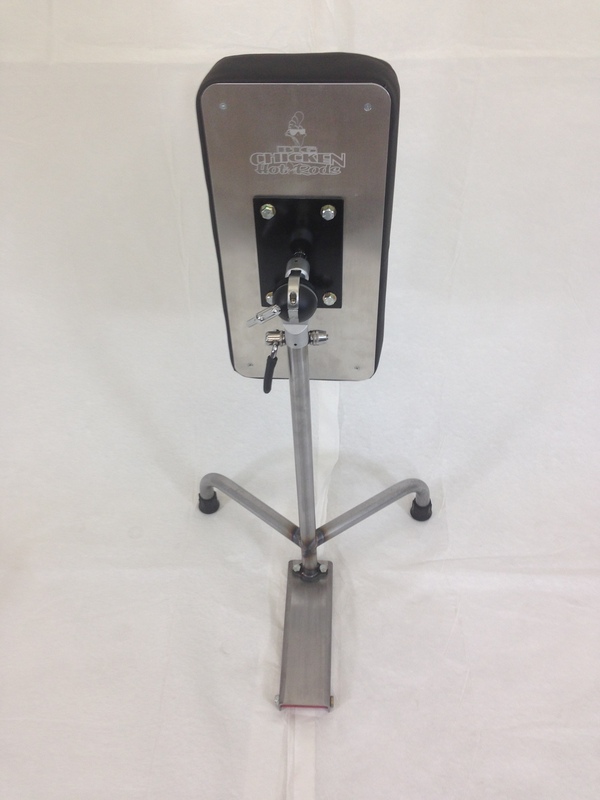 After looking at 100′s of tattoo arm rests and talking with lots of artists with lots of experience kindly willing to share their knowledge, I honestly believe we are making the most thoughtfully made, most infinitely adjustable, and stable arm rests on the planet.